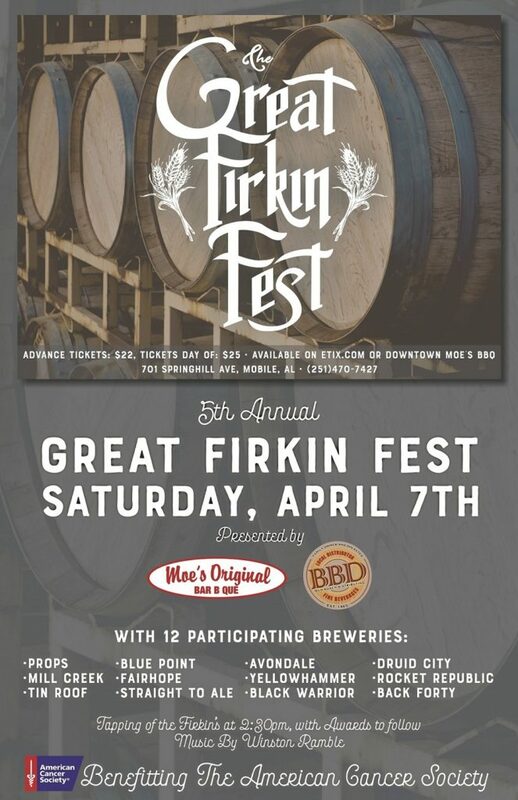 Presented by Moe’s Original Bar B Que and Budweiser Busch Distributing, the 5th Annual Firkin Festival takes place on Saturday, April 7th at 710 Spring Hill Avenue in downtown Mobile, AL. Participating breweries will showcase distinctive cask ale in a firkin, a barrel made of stainless steel that holds 10.8 gallons of beer. Firkins are unique in the sense that the beer goes through a secondary fermentation in the vessel. This year’s participating breweries include Fairhope Brewing Company, Avondale Brewery, Back Forty Brewery, Black Warrior Brewery, Grayton Beer Company, Mill Creek Brewery, Props Brewery, Rocket Republic Brewery, Straight to Ale Brewery, Garr’s Brewery, Tin Roof Brewery, Yellowhammer Brewery and Druid City Brewery. Doors open at 2pm with a tapping ceremony at 2:30pm. Sampling ends at 5:30pm with an awards ceremony at 6pm. There will be live music featuring Winston Ramble. The all-inclusive Firkin tickets are $22 in advance, $25 at door and includes entrance to the festival, samples of each firkin, crawfish, sample glass, koozie, literature and live music. The event benefits the American Cancer Society.